Finished my gen army (savor one) and i've been working the sura army to match them, but since they are scattered across various accounts unlike the gens, i intend to leech some of them @ NCT to make the time a bit quicker. It'll be a pure leech; i wont be turning in with the leechers but they will always be on a manual. 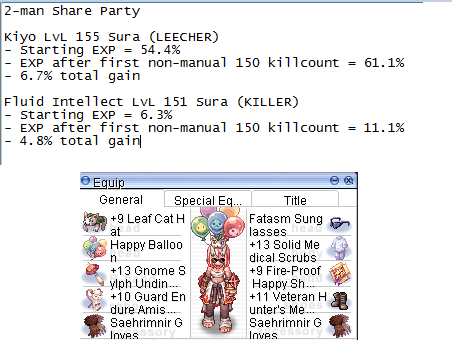 I figured i'd post this since its not really a secret so much as it is a proper collection of knowledge (if you know the game+gear), because the amount of extra experience you can get from leech gear these days is hella nice. Keep in mind, this is for NCT only (Nightmare Clock Tower if you dont already know), which houses mostly the formless-type Big Bell monsters. Edited by Fuuton, 08 February 2019 - 11:17 AM. that's not an assumption, that's how the game works. but if it doesnt stack, then simply subtract the 5% from one of the iron fists in the saehrimnir gloves. you'd get the 10% (glove by itself and set effect) from one glove, but still another 5% from the 2nd glove by itself for the 15 instead of 20. It's doesn't matter how incompetent anyone is, set effects is a game call and only ever activate once, the only time they could bug out is by not having a set script on them at all in which case it won't call it ever. good to know. easier to say ^^. but again, there have been times in the past where issues were present w/ descriptions. and shuck, you shouldn't make me out to be some kind of arrogant know-it-all. i know a lot, but i don't know everything and never once claimed to. the past few responses to any thread i've post from you have been "fuuton, you should know better".. which is rather arrogant to say in itself, since i wouldn't be posting about things that i was unsure of without saying i was unsure of it, which i did. less attacking, more solutions presented please. i would direct that statement at anyone. But I didn't direct it like you should know better, just stating that when it comes to set bonuses, either it is on or it is off. There is no middle ground. nah i know, i wasn't accusing ya of anything nirv no worries. you gave an answer in an approach i can appreciate. and costume goggles. thought i needed the beholder/formless set on the killer at first but it was doing more than enough dmg to one shot and i could have actually removed it and stuck it on the leech, but i didn't due to laziness and already being set in the current grind. the fatasm sunnies & the valk hammer are for SP purposes only, since i cloak. scrubs for just in case of de-cloaking.